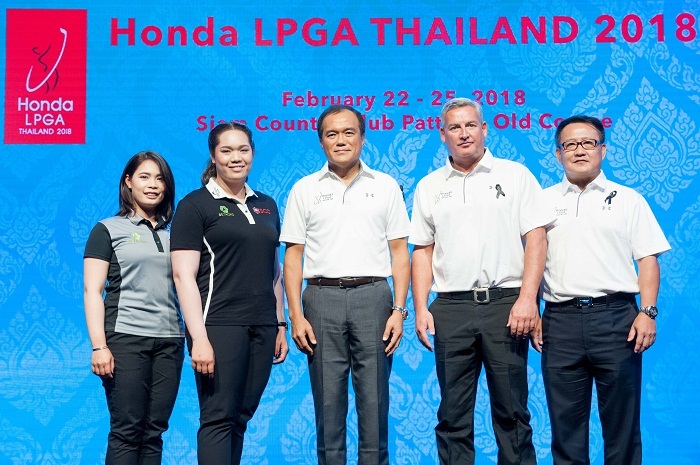 Photo shows: Mr. Pitak Pruittisarikorn (centre), Chief Operating Officer, Honda Automobile (Thailand) Co., Ltd.; Mr. David Rollo (2nd right), Vice President, Golf – IMG Events; Mr. Setthavut Janwowwam (far right), Chief Content Officer, MCOT Public Company Limited, and the two LPGA players Ms. Moriya Jutanugarn (1st left) and Ms. Ariya Jutanugarn at the recent announcement on Honda LPGA THAILAND 2018 which is scheduled to kick off in February 2018. The annual sport event has been the stepping stone for amateur and professional golfers as well as young golfers to pursue their dreams in golf. The press conference was recently held at The Renaissance Bangkok Ratchaprasong Hotel.